Around here champ comes with a grilled pork chop or a few sausages. Heat the spring onions and milk in a small pan over medium heat. When it just reaches the boiling point, remove from the heat, cover and leave to infuse. Boil whole potatoes in their skins until tender. Drain and peel the potatoes, then leave in a colander for a few minutes to dry before mashing or ricing. Gently reheat the milk and onion. Make a hollow in the centre of each serving to hold a knob of butter. 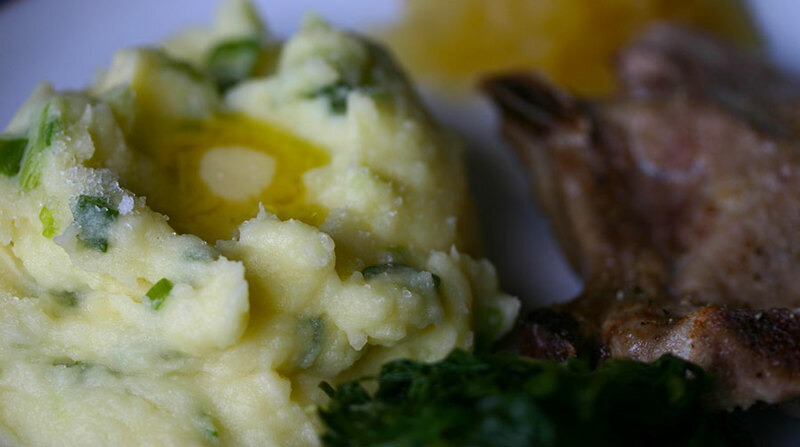 As a huge mashed potato fan, I’m ashamed to say I haven’t ever tried this dish! This is a classic dish in my Northern Irish family. We call it ‘Poundies’ and cover the butter in the mash to make a ‘birds nest’ that you discover when you dig your fork in and the melted butter streams out. Fond memories of the days before lactose intolerance set in! I love the idea of a hidden buttery centre in the mash. Thanks for sharing that!